Welcome to the Homepage of IGG e.V. You can check our site with many pictures and videos about our club. Opening times: Please note our calendar. Here you can see when we are present on the layout. On every Saturday we have a “Adult Day”. On this day only the adult club members driving with his own locomotives. On any other Sunday, we try to drive, if the weather conditions will allow it. Here every club member can use the layout. 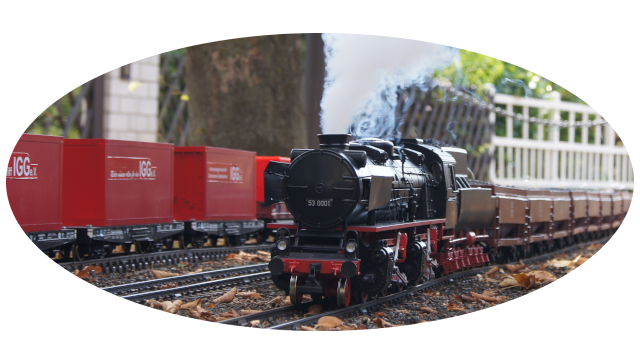 Interested garden railroaders and those who want to be there, are to be invited to a “taster day”. If you like our club you can, or even the whole family, be a member. More information is available here. If someone wants to support our project financially, we would be delighted.